Provide an overview of emails along with attachments. Support Dual Scanning Modes: Quick Scan & Advance Scan. Scan and Preview Any Size of PST File. Compatible with PST File of Outlook 2016 & all below versions of Outlook. Does not Require MS Outlook Installation. Pro version of the software support Print option while export of PST to PDF file. Once the software is launched, it will load all the emails and their data items with absolute formatting.Forensic experts have the need to examine PST file and to get access of the emails along with attachment. Even users are free to get detailed info regarding email data items such as subject, size of message in KB,etc. In order to recover PST files, the software support dual file scanning modes. While performing a quick scan, tool loads all the data consisting in the PST file. Additionally, advance mode is also recommended if the user needs detailed analysis of PST file. Depending upon the intensity of corruption, these scanning modes help us to recover the damaged PST file data as well. 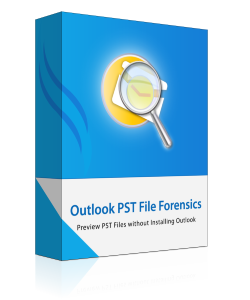 Outlook PST File Forensics could only be possible if the tool used by Forensicator is comfortable while examine any PST file. So PST file analysis tool helps you to view the screen on the basis of your convenience. The default view mode of the tool is horizontal and if you find it easier to view the screen in vertical mode, then you can simply switch the screen in vertical mode. Outlook PST File Forensic software looks similar to Outlook Styled View. The smooth UI of the tool makes it user friendly and helps investigators to easily use the software to reads PST file and extract importanat info from it. DEMO version allows you to scan, add and preview the evidence available within PST files. To export evidence in PDF, PST or EML, go for PRO version. Upgrade to Outlook PST File Forensic Pro for Advance Search & Export Option. Support: Windows 10, Windows 8.1 & all below versions of Windows. Disk Space: 10 MB of free disck space. Is it possible to analyze a protected PST file any Password known? Outlook PST File Forensic Software is totally cost free tool and you did not to pay any charge for using it. Can I need a separate version of the tool while using software on Windows 8? No, you did not to buy a separate version of the software as our software is compatible with all versions of Windows OS. Being custodian, I was looking for splendid solution that would enable us to examine PST file without Outlook installed. It was great news the Outlook PST file forensic software can be the best choice for the best forensic solution I ever worked with it. It allows to apply depth analysis on PST Files as well as recovered some of PST files which are not accessible. Working of the Outlook PST file forensics software is really amazing and it is the best choice for the forensic investigator choice to give the best analysis of the PST file and later recover also some inaccessible PST file. It is an excellent help for litigation leading attorneys. Thanks to Revove groups software for performing best in all aspects.